This monotype is the first I’ve done in a new medium, which combines acrylic underpainting and monotype overprinting. It’s an exciting, color and texture rich technique that I plan to continue to explore. 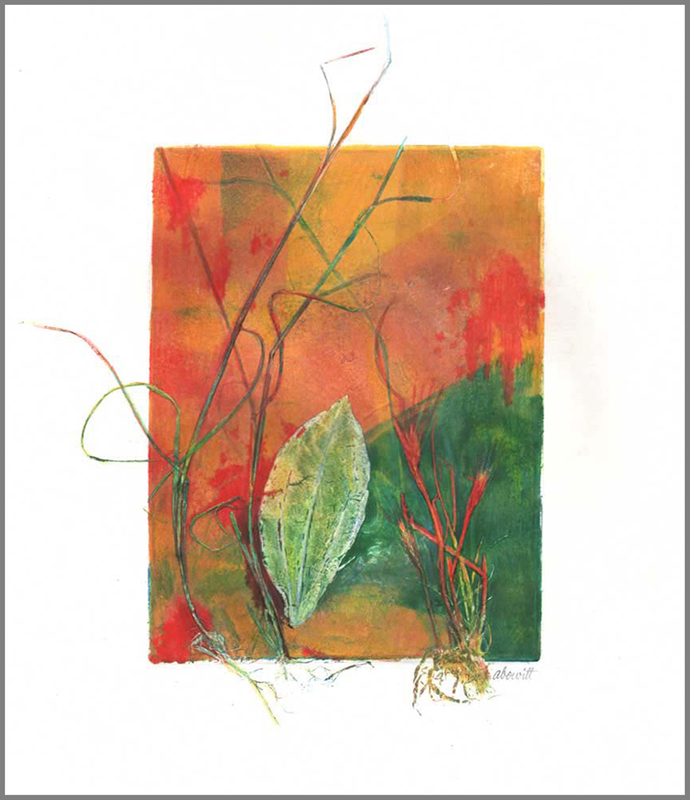 Monotypes: One-of-a-kind original prints. They are made in a variety of ways, by adding or subtracting ink to create images. An image is created on the surface of a plate, transferred to damp paper by applying pressure, and the paper is lifted off, with the impression revealed in the reverse of how it appears on the plate. (This image reversal is true of all hand-pulled print processes.) One or two "ghost" prints may be pulled from the same inking, but they will be much fainter since most of the ink will have lifted off the plate with the first print. Sometimes additional ink is added to the plate so that the ghost is partly like the first impression, but different because of the additions. The plate is cleaned and re-inked for another image. There are no lines incised on the monotype plate, so this will truly be a unique print. Monoprints: If a plate already has lines incised, for example an etching with an image previously created, and ink is added to the surface to make this a unique print, it is called a monoprint. Some people use the terms monotype and monoprint interchangeably, but they are not the same thing. The matrix for monoprints may be plates created in many of the mediums on this site. They can be traditionally created plates or use unusual, experimental materials. 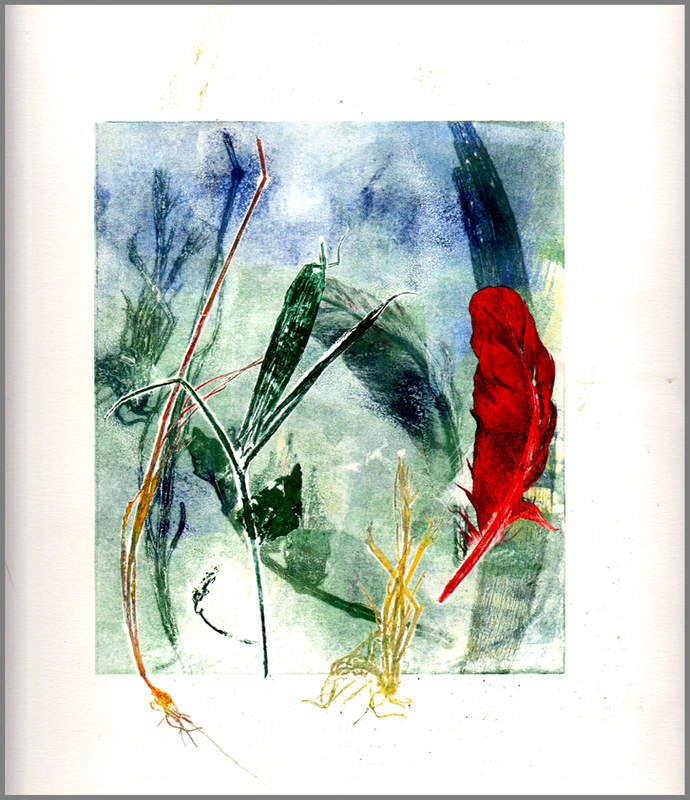 Collagraphs are created by making a plate from mat board, found objects, and other relatively flat mediums that are adhered to a backing board. (The word is derived from "collage," a French word that means to paste.) The built-up plates are covered with a medium or foil to make them impervious to printmaking ink. The ink is applied, wiped like an etching, and printed with extreme pressure on an etching press. Hand-coloring: After the ink on an impression (print) is completely dry, if it is not easily smudged or soluble after it dries, a variety of additional mediums (e.g. watercolors and colored pencils) can be used to color the print. All images are unique and printed on an etching press or by hand. They may be enhanced with colored pencils, watercolors, and/or other artist grade materials. Intaglio images are printed on 100% rag Rives BFK, Arches, or similar archival acid-free printmaking paper. Inks used are the highest quality professional printing inks (primarily Charbonnel, Caligo, Daniel Smith, and Graphic Chemical).